The Rural Rambler: Huff Run Water Bottles - Now On Sale! 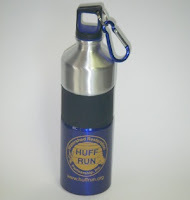 Huff Run Water Bottles - Now On Sale! Have you ever said to yourself, "I'd love to support my local watershed, but I'm so thirsty...what should I do?" Well the answer is here Rambler Readers, thanks to Maureen, Mel, and the whole Huff Run crew. These stylish (and BPA free) bottles announce your committment to responsible hydration and the restoration of our natural streams. Find out more, including how to get yours, below. Holding 25oz of your beverage of choice and including a handy matching blue carabineer, these bottles are road ready. With a three tone color scheme; the bottom is royal blue emblazoned with the orange Huff Run logo, the middle is a black rubber gripping area and the top is silver aluminum, they are light weight and 100% recyclable. Perhaps most importantly, profits from water bottles will support unfunded needs for the Huff Run office, namely the 2010 gas and electric bills! Now that you're sold, it couldn't be easier to get your own Huff Run Water Bottle. Buy one securely and quickly through PayPal at the Huff Run Website using your PayPal Account or any credit card. Checks are also accepted and although it is preferred that you pick up the bottle at the Huff Run Office (or make arrangements to meet a staff member) although you can also pay $2.50 for shipping and we'll be glad to send one out to you. Thank you for your support and don't forget to hoist one for Huff Run!